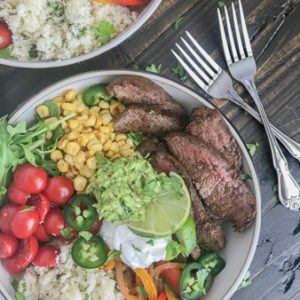 Steak Fajita Bowls with Garlic Lime Cauliflower Rice – these fajita bowls will complete your Taco Tuesday cravings! The steak is marinated in a garlic lime sauce and is super tender, as well as flavorful. This dish is perfect if you’re looking to drop the tortillas and rice. Both have been replaced with a Garlic Lime Cauliflower Rice helping to make it a low-carb, yet filling well-balanced meal. Meals that come as a smorgasbord of ingredients in a bowl have to be the best meals in my honest opinion. I’m not one that is afraid to mix things together and I love to pack as many vegetables into a bowl as I can. This recipe came about because leftovers in this house (whether from the fridge or freezer) are essential when you’re having a lazy day. Or a busy day for that matter. And who doesn’t love leftovers? Sometimes food is better the second time around. Right? 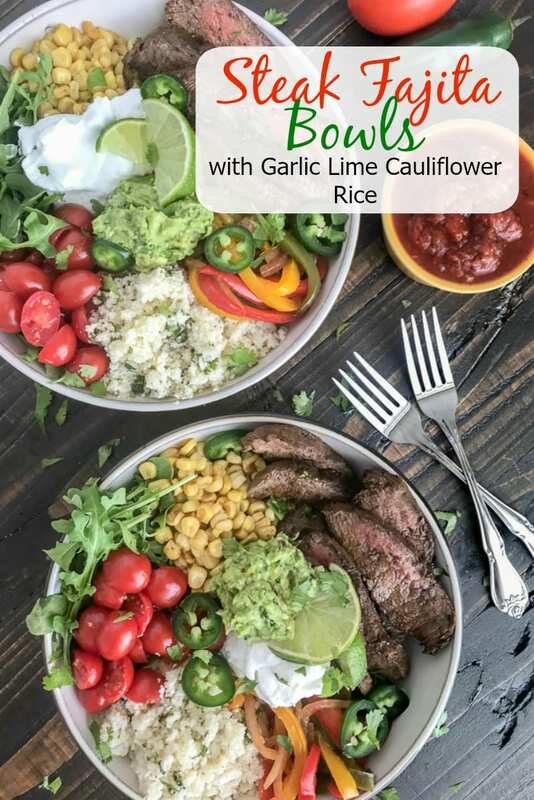 These Steak Fajita Bowls with Garlic Lime Cauliflower Rice are perfect for date night or if you’re having a get together with family or friends. The marinade for the steak packs a punch of flavor that helps to compliment not just the cauliflower rice, but the rest of the ingredients. 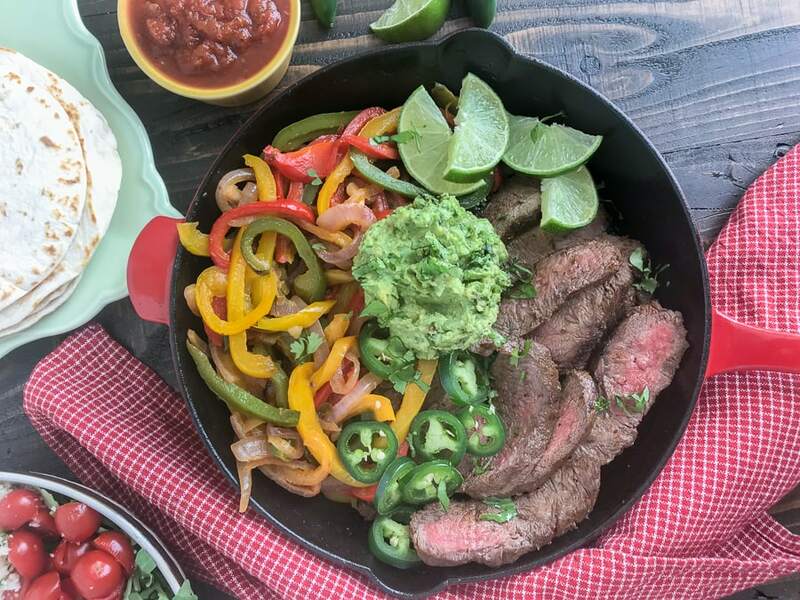 The fajitas are super simple to make and can be on your table in around 30 minutes (excluding the time it takes to marinade that is!). Tastes like take-out, but done at home and a bit on the healthier side. Because indulgence should come without so much guilt! I cooked the steak in my cast iron skillet, but you’re more than welcome to toss it on your outdoor grill or into a large nonstick pan. I’m not one to stand outside in the winter to grill up a piece of meat. If you’re one to tough it out and do so – I applaud you. But I prefer not to. Once you’ve cooked the steak, you can construct your bowl with the ingredients listed in the recipe or the ingredients of your choosing. 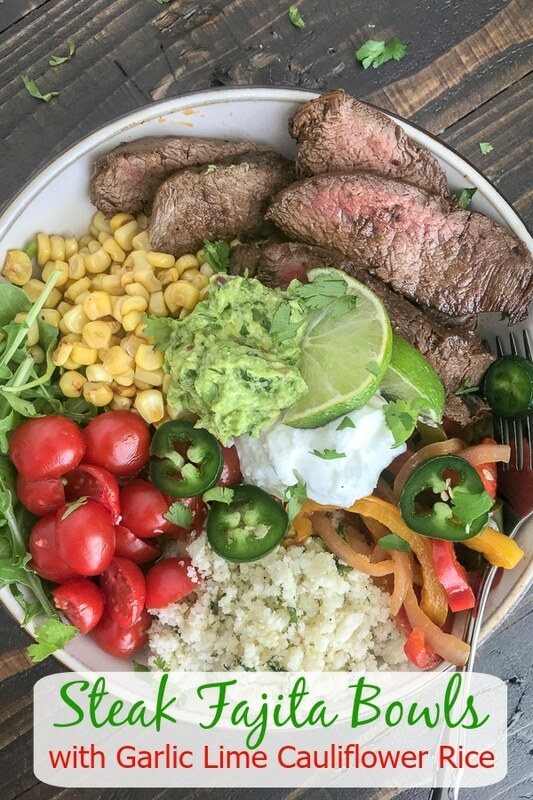 Whatever it is – I guarantee with this Steak Fajitas recipe, as well as the Garlic Lime Cauliflower Rice one, is going to be the star of the bowl! This recipe can be served with my Garlic Lime Cauliflower Rice or you can use plain cauliflower rice that is sautéed in a pan with a bit of olive oil. If you’re new to making cauliflower rice, never fear – I have the perfect How To Make Cauliflower Rice all ready for you. If you’re not a fan of steak, you can absolutely replace it with chicken breast. Cilantro is optional, but if you’re not a fan – you can omit. Any garnishment or toppings listed in the recipe are optional, as everyone prefers their own toppings to fajitas or taco dishes. The nutrition is calculated with the cauliflower rice, tomatoes, peppers and onions, steak, and arugula. If you add other toppings to your bowl – add the nutrition accordingly. 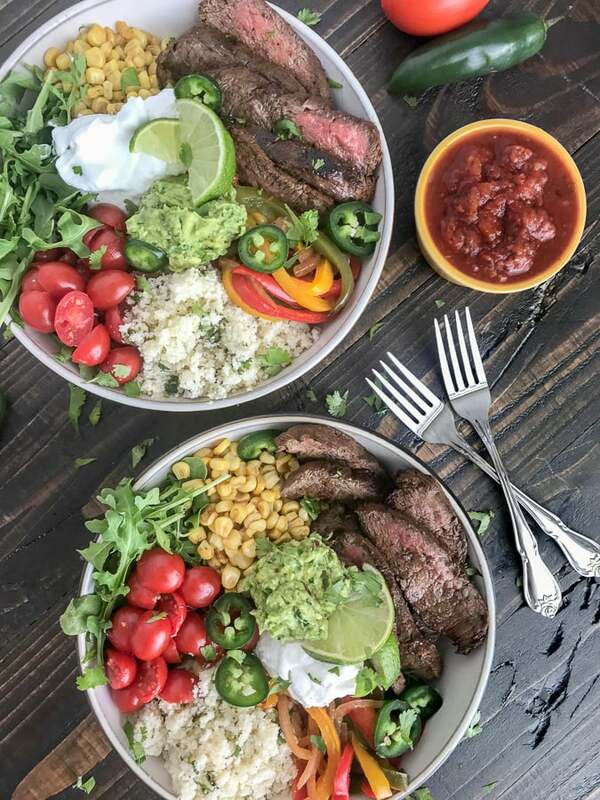 Steak Fajita Bowls with Garlic Lime Cauliflower Rice - these fajita bowls will complete your Taco Tuesday cravings! The steak is marinated in a garlic lime sauce and is super tender, as well as flavorful.This dish is perfect if you're looking to drop the tortillas and rice. Both have been replaced with a Garlic Lime Cauliflower Rice helping to make it a low-carb, yet filling well-balanced meal. Remove stem and leaves from head of cauliflower. Cut into small florets. Place florets into a food processor (or blender) and pulse until the cauliflower reaches a rice-like consistency. Be sure to keep an eye on it while it is processing. You don't want to over-process it. Place a large, nonstick pan with olive oil over medium heat. Once heated, add the minced garlic and cook until fragrant. Approximately 1-2 minutes. Add the cauliflower and seasonings to the pan: onion powder, salt and pepper (as listed or to taste). Stir to combine. Allow to cook 3-4 minutes, stirring occasionally. Add the lime juice and continue stirring to combine. Remove from heat and add the cilantro. Serve immediately. The steak and sautéed veggies will take a little time to cook, so once you've got that going, start cutting and processing the cauliflower florets to soon cook. You can warm the corn in the microwave or in the same pan with the veggies. I tossed it into the cast iron skillet after I sautéed the peppers and onion. 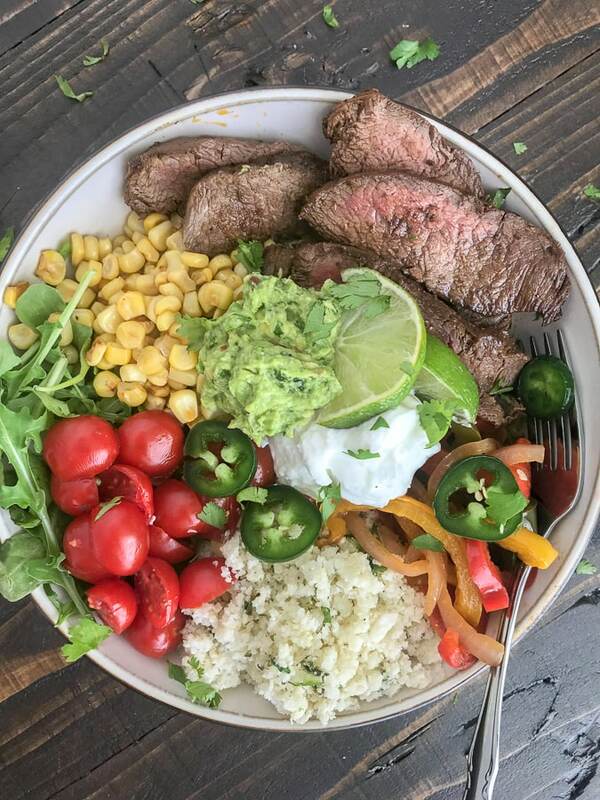 Arrange the cauliflower rice, arugula, cooked corn, steak and veggies into a bowl and add whatever toppings you would like; salsa, pico de gallo, plain greek yogurt, Cilantro Lime Avocado Mash, jalapeños, or whatever your taste buds love most! If you're new to making cauliflower rice, never fear - I have the perfect How To Make Cauliflower Rice all ready for you. If you're not a fan of steak, you can absolutely replace it with chicken breast. Cilantro is optional, but if you're not a fan - you can omit. Any garnishment or toppings listed in the recipe are optional, as everyone prefers their own toppings to fajitas or taco dishes. The nutrition is calculated with the cauliflower rice, tomatoes, peppers and onions, steak, and arugula. If you add other toppings to your bowl - add the nutrition accordingly. If you use canned corn, be sure to drain the water out prior to cooking. Nutrition is based on 1 of 4 total servings (bowls) with 1/2 cup cauliflower rice, 1/4 pound of steak, 1/2 cup corn, 1/2 cup of cherry tomatoes, 1/4 serving of sautéed peppers and onions, and 1/2 cup arugula. WhEre can i find the recipe for the steak?